Dr. Little will give a slide presentation on "Daoist Arts of the Ming Court." The talk will begin at 3:00 p.m. and is free to the public. It will be followed by a public reception from 4:30 to 6:00 p.m. where refreshments will be served. In recent years there has been a surge of interest in both China and the West in Daoism, China's mystical folk magic and religion. The usual impression of Daoism is that it was mainly followed by the common people and by itinerant priests, while the Emperor and the court bureaucracy were followers of Confucian rules of statecraft. 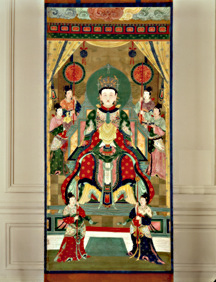 Dr. Little's lecture will present little known or newly discovered works of art that show that several emperors during the Ming dynasty (1368-1644) were strong believers in Daoist gods and practices. Examples of this practice include the Yongle emperor's (1403-1424) veneration of the Daoist god Zhenwu, Supreme Emperor of the Dark Heaven (Xuantian shangdi), and the single-minded devotion of the Jiajing emperor (1522-1566) to religious Daoism and alchemy. The talk will also include slides of a recently discovered Ming dynasty Daoist painting, a long handscroll created for the imperial court in 1493, which sheds new light on the function of religious Daoism at the imperial level. This scroll records a Daoist ritual carried out at the imperial court by Zhang Xuanqing, the forty-seventh Celestial Master of the Zhengyi (Orthodox Unity) Daoist sect. Stephen Little has just assumed the position of Director Designate at the Honolulu Academy of Arts, after serving for more than seven years as Pritzker Curator of Asian Art at the Art Institute of Chicago. He holds a doctorate in Art History from Yale University and is a well known authority on Chinese painting, calligraphy, and ceramics; Japanese painting and woodblock prints; and Tibetan Buddhist painting of the 13th-15th centuries. He is the author of numerous highly regarded exhibition catalogs, including Taoism and the Arts of China (Chicago: Art Institute of Chicago, 2000).